Harvest when the buds show color. One report stated 40F, 4-6 weeks dry in boxes. From the Greek “ornis” (a bird) and “gala” (milk), probably alluding to the egg-like color of the flowers of some species. 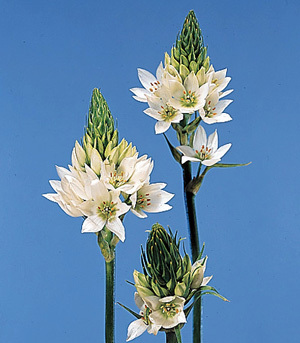 The specific epithet name “thyrsoides” is in reference to its compact flower type. One common name (Wonder Flower) was believed to be used because it lasts so long. Harvest when flower buds show color. Philosoph-Hadas et al. (1995) showed that chemicals added to postharvest uptake solutions that can control calcium levels can inhibit or greatly reduce stem bending when they are laid horizontally due to geotropism. However, at the time of this writing such a product is not yet commercially available.